When looking at how U.S. retailers are performing in these areas and others, Episerver names Apple's mobile site as the best one in retail. While this may come as a surprise to professionals following Apple's previous reluctance to make the switch to a dedicated mobile site or one responsively designed, Apple's site now provides easy navigation, strong search capabilities, subtle animation and other features improving the user experience, according to Episerver's, "U.S. Retail Website Benchmark 2015" report. 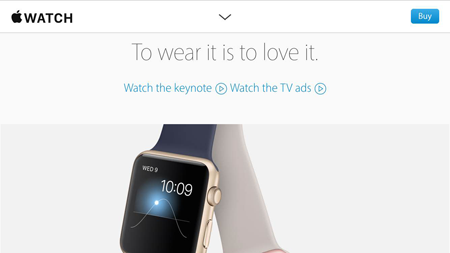 Another noteworthy update to Apple's mobile site is its blend of commerce and content. On the Apple Watch landing page, for example, the company provides beautiful product imagery, detailed product descriptions and links to content (videos, "learn more" type articles and "guided tours). As a user swipes, a static "buy" button reminds them to move through to purchase. To provide an omnichannel experience, one of Episerver's top recommendations is to invest in content, similar to how Apple has done. The report reads, "By incorporating genuinely helpful content such as recipe suggestions, how-to videos and user guides, marketers not only maintain the interest of potential prospects, but can also encourage additional purchases throughout the process."